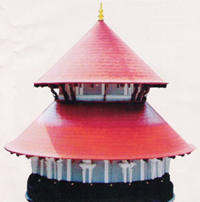 Thrissur Thaikat Mooss family have two Dhanwantari Temples in Thrissur. Situated on the outskirts of Thrissur town, Peringavu has all the simplicity & serenity of a village and comforts & facilities of a town. Now this is a part of Thrissur Corporation. Decades back this place, according to hearsay, was called “Perumkavu” means thick forest, which later on came to be called Peringavu. An old Dhanwantari Temple is situated here. The main diety is Lord Dhanwantari, who is the Amsavataram ( partial reincarnation) of Lord Mahavishnu and is believed to be the God of Health. Lord Ganpathy, Lord Ayyappa and Goddess Bhadrakali are also worshipped here. The sanctum sanctorum is constructed in round shape with 2 storeys, which is a rare design in the Kerala temple architecture. There are many elegant on the glory of this temple. About 3 centuries ago, a pardesi Brahmin (yathi) came to this place and stayed in a hut (parnashala), where the present temple exists. He used to worship a ‘salagramam’ ( an idol ) possessed by him. He was also said to be having supernatural powers and the people of the locality were attracted by his divine powers, achieved by worshipping the diety. The Maharaja of Cochin who ruled at that time had a great affinity and admiration for elephants. He possessed a number of elephants. One of his beloved elephant stationed in the above place, fell sick during those days. Due to the persistent ailment, the elephant was in a critical stage. None of the renowned physicians or doctors in the country could cure the elephant. However , Ashtavaidyan Thaikat Achhan Mooss treated the elephant on the Maharaja’s request and cured the elephant. The Maharaja was very much pleased with the Mooss and gave him the land and surrounding areas where the elephant was stationed during the treatment, as a token of gratitude. In 1974, administration of this temple was handed over to a public committee. Recently, it was found in the ‘ Devaprashnam’ (divine astrological research) conducted during October 1980 that the Peringavu Temple is as old as 900 years or even more. A particular day – OUSHADHASEVA DINAM every year is celebrated as ‘Day for Medicinal intake’. On this day a specially prepared and sanctified medicine is distributed to general public. People from all parts of the world visit the temple to have this divine medicine on this day. This temple is located 4 kms east of Thrissur town. 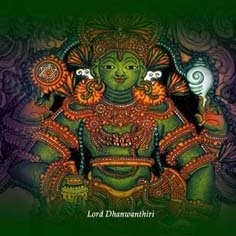 The presiding deity is Lord Dhanwantari. The saga of the temple goes like this:- The Ashtavaidyan Parappur Mooss was the chief physician in the court of King of Kochi. Once the King became ill. None of the Vaidyas including the Chief Physician could cure him. A dejected Mooss vigorously worshipped Lord Vishnu. Pleased by the dedication of the Parappur Mooss, the Lord appeared in front of the worshipper in the form of Lord Dhanwantari and gave him divine powers to cure any uncurable diseases. Subsequently, the Mooss treated the King and got him out of the dangerous ailment. Parappur Mooss built a temple for Lord Dhanwantari where the God appeared. Later, when there was no successor in the Parappur Mooss family, the King gave all the properties of the Mooss’, including the temple, to another famous Ashtavaidya family – the Thrissur Thaikat Mooss. In recent years, the chief of the Thaikat family made a committee to look after the administration of the temple to assure the participation of the general public. All people donate offerings to this temple for a speedy recovery before starting any treatment. With the Lord’s blessings, most uncurable diseases are cured. The main offering of this temple “Mukkudi” is a very good medicine for all diseases as well as preventive one for all ailments in future also. Worshipping the Lord Dhanwantari on Thursdays are very much fruitful to get his blessings.